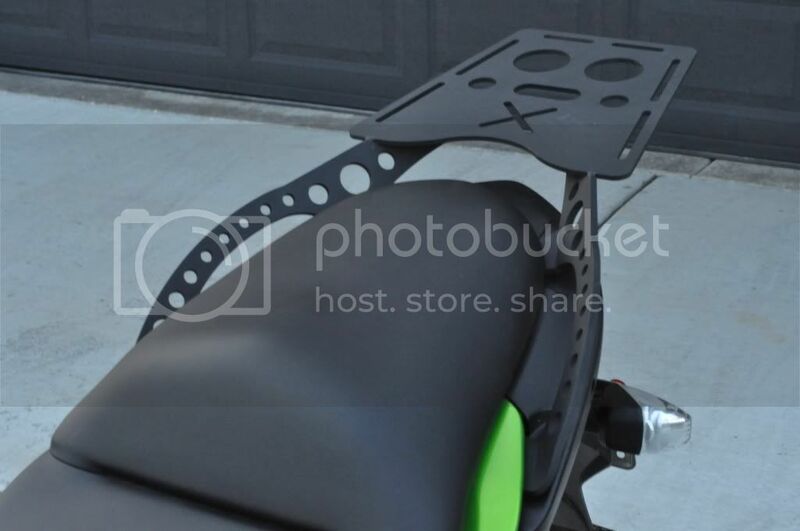 I wanted to get some honest feedback on this rear rack. I am an engineer and designed the rack. It is very heavy duty and strong and will support as much weight as the subframe can bear. Made from 3/16 and 1/4 steel. 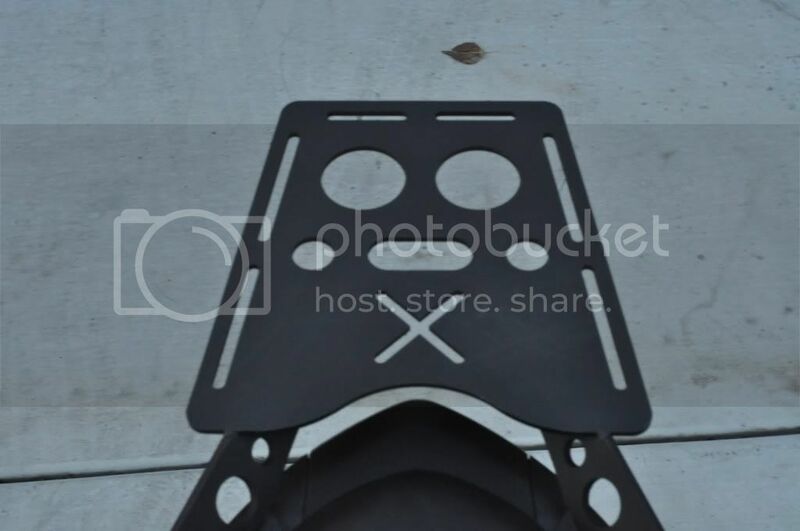 The rear plate is about 10 x 7 Inches. Powder coat finish. This will mount up in 10 minutes. Let me know your thoughts as far as looks and what you would pay for this. Any and all feedback is welcome. look fine to me and what's the cost for a unit and doest it allow easy fitting of back case from any make. Before you become famous, let me be the first to say that I'm available for a long term test and evaluation of the product. Just trying to do my part for the Versys community! I think it looks better than any other on the market and appears stronger. 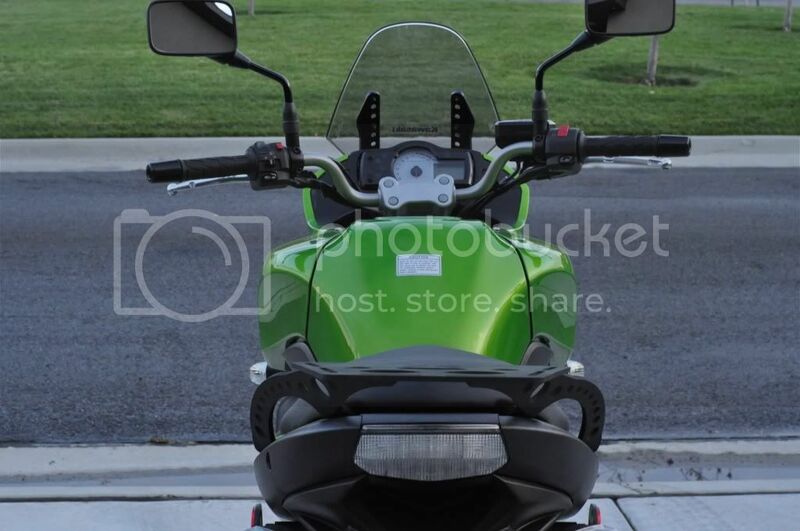 I was surprised by the lack of rack options for the Versys. I believe you have a winner! Last edited by Stazjemo; 10-07-2010 at 02:11 AM. Fits the styling of our bike to a TEE! Wouldn't fathom a guess on pricing but would certainly consider buying one. What is the cost of existing products out there? Aerodynamically sound since 1959. So says the good folk @ Lockheed, Atlanta GA.
"Wounds heal, chicks dig scars...Glory, lasts forever!" 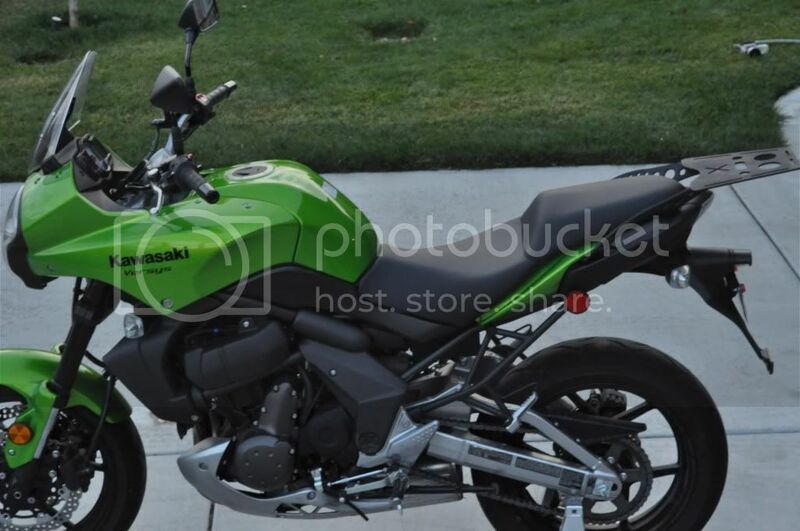 I've been rear rack shopping, ordered the Givi, just waiting for it to show up (this week?) If yours was on the market, I'd have bought it. Hands down, looks awesome. I think it looks good. I wonder though, have you checked for fitment with all types of case mounts? Reason I'm asking is I just installed the SW Motech rack and mounts for a pelican case. Directions absolutely sucked, but the finished product turned out great. Is there flex enough in the arms to allow for some errant welds/mounting point placement on the subframe? Only other detail I would look at is rear passenger contact. 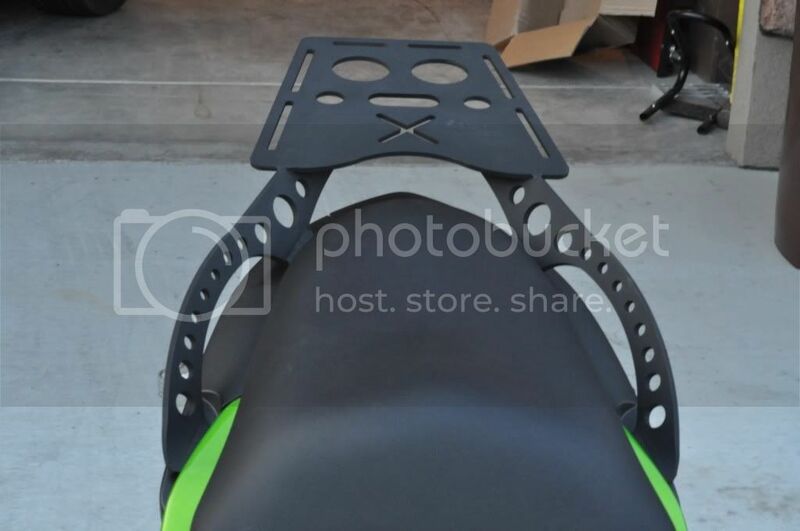 Are those machined edges going to be uncomfortable to sit on/ contact with the soft bits? I think it's a great looking piece, looks to be well made, and it's USA fabbed as well. Good job! Pretty, but looks damn heavy. What does it weight? ditto above about uncomfortable for passenger grab rail. Looks nice, how heavy is it? For those times when I have a pillion on board it wouldn't work for me, but that's a great looking piece. Nicely executed. What if you had a slip-on or quick bolt-on passenger grip/cover as an option? Very good looking rack. 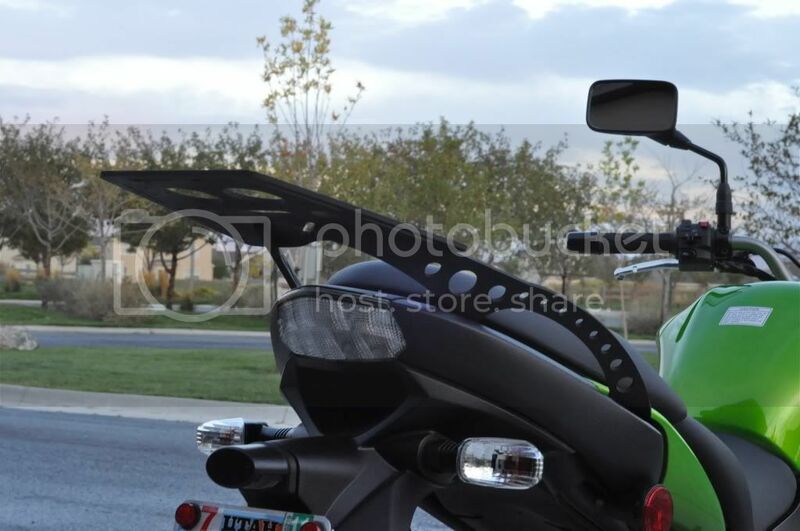 My concern would be if it fits with side luggage racks such as Givi and other. I would be buyer and as far as price, you need to look at cost and selling price of products out there. Location: Ellijay & Suwanee, GA.
Really like the design though as I have been wanting something simple to add a small box or strap a backpack too, instead of bungee cords & my seat. Well made and Well done! Looks good. See the holes are meant for weight savings. Could be incorporated with SW Motech base plate, one could use it with a topcase, Removed the base plate and it becomes a rack. Looks really good. I like the many holes which would be great attaching points for straps, cargo nets and baling twine. Maybe a split thin walled rolled tube across the grab handles? I would buy if priced competitive to other racks. As for cost, I'd say you'd have to be able to beat the competition significantly to sell many units. The competition has an established reputation and typically warantees their product. You can usually find ride numerous reports about these racks so they are a known quantity. The competition has known compatibility with side luggage racks. Many, if not most, top case buyers will also want side cases. They also let you know what needs to be done to mount the various brands of cases to their racks. At least some of the competition has aluminum racks available, and weight of components is a significant factor among owners of sub 400# bikes. I'm thinking it would be hard to meet that price and still cover production costs, much less make much of a profit. More than that though, and SW Motech, Happy Trails, or Givi look like better/safer purchases. For the top rack alone, you could probably find a few buyers at $75-$125. Back Off! I'm Already Riding Way Beyond My Abilities. Thanks for all the quick responses, I appreciate the positive critiquing and ideas. The current weight is 6 lbs 4 oz. I can make an aluminum version if the feedback here was such. Maybe both options? I am just trying to consider pricing. I would guess an aluminum version would cost 175 or so. I would also like to make the adapter plate for SW fit so if anyone can send me the bolt pattern dimensions I will change the top up to allow for that plate to bolt on. I would like to consider other luggage as well so if anyone with Pelican or any other requirement chimes in that would be great. As far as the side racks go, I am also working on my versions of those. Again, any input on features that would be nice that don't currently exist are really appreciated. As far as the side supports, all the edges have been broken or polished off and I had a friend comment on how easy it was to grab the handles/rails. Perhaps they could be plastic coated though. They do sit a little lower than the stock hand rails but I really never intended to have any passengers ride. I will be making a small run of these when I get all the additional changes from this forum incorpertated. Again, please let me know any more ideas, changes and input, this forum is great, thanks again! When I get home tonight I'll try to remember to pull my sw plate and scan it with measurements. Pop me off a PM with your email addy so I can send that to you. The only other input I could give you is to mod the handles a bit to support a passenger, even better yet a passenger with a littlt "junk in the trunk". Even at $200 that rack is a good deal, and even better if it's aluminum at that price. Last edited by alex182; 10-07-2010 at 11:31 AM. Looks very nice, my concern would be if you have an accident and the bike hit you, looks like it would cut you in halve. Last edited by Nytrydr; 10-07-2010 at 05:33 PM. Looks great!! And welcome aboard!